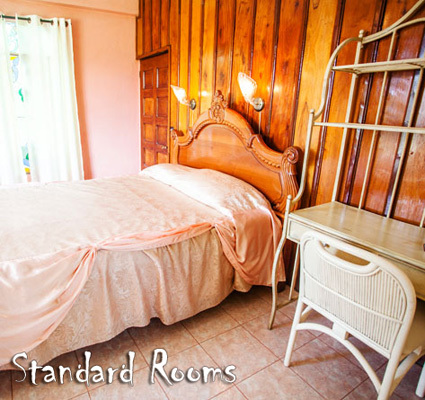 Nestled in a quiet jungle setting, in the midst of colourful singing birds and tropical wildlife, this jungle resort ranch features delightful accommodations that blend with the lush landscape and local culture. Situated on the Mighty Belize River and central to all of Belize, this ranch is a place where the horses roam free and huge iguanas laze in the branches. The lands here are surrounded by evidence of both the ancient Maya and a historic logging tradition. You will find a variety of activities - daily horseback riding, a float trip on the mighty Belize River or visiting tours to the nearby Mayan sites. 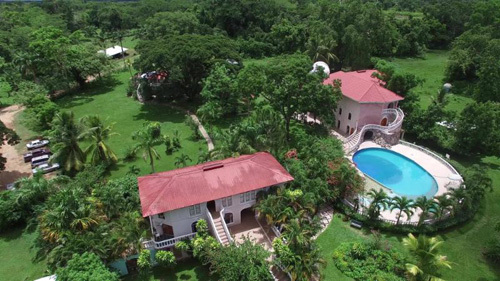 Home to the finest Equestrian center in Belize, we will give you something different than the tired tourist horses you will find elsewhere and in a setting perfect for eco-exploration. If you've ridden over mountains, prairies and parkland we know your expectations are high. Can the tropics show you anything you haven't already seen? Every day you will awaken to the shimmering glow of dawn materializing through the tropical haze. Horses grazing beneath the palms trees. The day is young and a sudden rush of excitement fills the air. It's time to ride! The ranch is big, beautiful and boisterous. Miles of jungle and riverside trails are awaiting you. There are opportunities to experience horsemanship in a variety of ways, from setting your own itinerary to participating in structured lessons. The well kept horses, quiet river, gentle tropical breezes, flocks of parrots, saturated sunsets, delicious meals, friendly people, and exotic surroundings will truly sooth your soul and quench your thirst for adventure! This is a place far from the real world and near to the things you've dreamed of. An exciting yet peaceful place. You will be taking more than pictures home. You'll have memories to last a lifetime! Rates include*: Four nights accommodations in cabana or A/C standard room, all meals, Cayo West Tour, boat/ river tubing, Mayan ruins visit, all road transfers. Pick-up/ drop-off for this trip is from Philip S.W. Goldson International Airport (BZE) or Belize City Municipal Airport (TZA) at any time on any day of the week. Check-out at 11:00am on the last day. After breakfast enjoy a half-day jungle horseback ride and half-day Cayo West Tour. Explore the vast area of the 200 acre farm with agricultural fields, tree farms, cattle grazing, and horse pastures. Cross small streams, canter on jungle paths and swim with the horses in the Belize River. After lunch, visit either Xunantunich or Cahal Pech. For those interested in a little less riding and more sightseeing - you can do the full day Cayo West Tour: The day starts with a visit to either Xunantunich or Cahal Pech. Each of these are unique sites and choosing which to visit is difficult as all are equally impressive. Your guide then takes you to have a wonderful lunch and shopping in San Ignacio or you may wish to visit the Butterfly Farm or the Mennonite settlement known as Spanish Lookout. Today you can choose all day riding ,which can be divided into a morning ride and afternoon ride with coming back to the lodge for lunch, or you can take your lunch with you picnic-style and enjoy all day out on the longer trails. Or you may even wish to only do a half day of riding and spend the other half of the day on the Belize River by boat or river tubing. Meander down the Belize River with our tour guide pointing out plants and wildlife (birds, iguanas, otters, howler monkeys, etc.). Or more riding and exploring the jungle on the Howler Monkey Trail, Tiger Creek Trail, and Devil Dip Trail. These trails span over the 4000 acres and let you experience the beauty of the jungle as well as open fields and teak plantations. After breakfast we take you to your next destination or back to International Airport for your flight home and if requested, you can visit the Belize Zoo (entry fee not included: $50USpp). See Kinkajous, Monkeys, Ocelots, Peccary, Tapirs, Birds including the Jabiru Stork, and many other exotic native animals of Belize. Your Belize horseback riding vacation will be unlike any other vacation you’ve had before. We offer the best horseback riding in Belize with miles of jungle trails combined with years of experience, on the 4000-acre property. Allow us to show you the thrill of riding through the tropical broad leaf forest as we point out birds, wildlife, trees and medicinal plants. Learn about the culture and the beauty of Belize. We also offer you an opportunity to participate in a hands on experience of interacting with horses. In the arena and round pen, communication between horse and rider begins to meld. Making it easy to do the right thing and difficult to do the wrong thing. These concepts, as presented by John Lyons and Pat Parelli, two of the most popular horse clinicians in the United States, are the basis for horsemanship at this location. Key words are communication, trust and discipline. In addition to trails, a variety of activities include barrel racing, gymkhana events, overnight rides are possible. About a hundred horses of thoroughbred mixed with quarter horse breeds are found at our farm. Years of careful hands on training from when they are foals, provide trustworthy but agile mounts that will easily carry you through the jungle trails. We train our horses as per horse whispering concepts and methods. We are experts at matching horses and riders. While we mostly ride western, we do have two sets of English saddles and tack for your use. Belize weather features a temperate climate with 2 distinct seasons, the rainy and the dry. The rainy season occurs between June and November with rainfall averages ranging between 60 inches/1,524mm in the north to 160 inches/4,064mm in the south. The rainfall is variable from year to year. Remember that you are in a subtropical climate so dress lightly - we recommend cotton clothing rather than synthetics. A poncho, in case of rain, will be provided. Riding helmets are provided but please feel free to bring your own to guarantee the fit. For the horseback riding, jeans (single seamed) and light boots or ankle high shoes are most suitable. You don't need electrical adapters if coming from North America! Plenty of water will be provided to you. Bring a bottle or camel-back if you wish. In San Pedro, the streets are sandy and unpaved so be sure to leave your fancy clothes and high heel shoes at home! This is a stationary ride, so nights will be spent in the same location. Nestled near the river in a quiet jungle setting, in the midst of birds and other tropical wildlife! The tropical jungle resort features delightful accommodations that blend with the local landscape and culture. 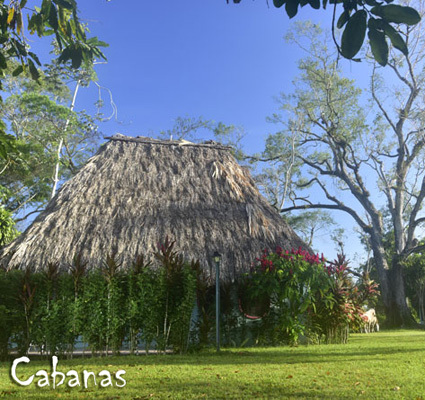 You will stay in standard rooms in the main lodge or in cabanas with roofs made from jungle bay leaf thatch and are uniquely designed. Built by local craftsmen with fine Belizean woods, they are, in themselves each works of art. All standard rooms and suites are equipped with A/C for your comfort (we also have some rooms in the cabanas with A/C). The cabanas and chalet rooms are equipped with ceiling fans and / or standing fans. On site you'll enjoy a swimming pool, bird sanctuary, and 14" Meade telescope for star gazing at night. Wireless is available at the front desk/reception area of the lodge and in the Chateau Brio building. Laundry is also available. Beautiful stained glass windows and solarium bathrooms make theses all delightful places to stay. The unique use of sea shells in a bathroom mirror, Carolyn Carr art, artistic tiling, local arts and crafts, honor the Belize culture and beauty in these designer rooms. Rooms are air-conditioned and have a reading desk, comfortable easy chair, as well as a queen bed, and most of them have a single bed as well. Four of our standard rooms are in the lodge which has a communal sitting area, adjacent to a patio that overlooks the river. The other two standard rooms are in our Chateau Brio. The building features curved stairs with beautiful banisters and amazing masonry around all the windows. On the second floor there is a large patio where evening conversation can be enjoyed. Inside the rooms you can relish the view of the beautiful landscaping and pool through arched, stained glass windows. With roofs made from jungle bay leaf thatching are uniquely designed. Crafted by the Banana Bank craftsmen with fine Belizean woods, they are, in themselves works of art. Each cabana has a solarium bath, a sitting room, and two bedrooms, each room with a queen size and single bed. Four to six family members, friends or groups traveling together can be easily accommodated in each cabana. Carved doors, original oil paintings and jungle ambiance create a truly memorable surrounding. Single supplement is mandatory if you are traveling as a single rider. All meals from dinner on Day 1 to breakfast on your last day are included. The dining room has an exotic feel to it. The tone is set by the soaring thatched roof. Carved banisters, pink gypsum stonewalls, and rich local hard wood paneling make this a beautiful place to enjoy. Our meals are served family style and are widely reported to be some of the best in Belize. The family atmosphere provides a setting for lively discussion between guests from different parts of the world and diverse interest. Menus vary but center around the kind of home cooking we call "grandma's food" although our girls cook up some of the best local cuisine found in Belize. Passport valid for six months beyond the intended length of stay required by all nationals referred to in chart. All travellers are required to show evidence of sufficient funds (minimum £50 per day) and proof of return or onward ticket at the point of entry. 1. nationals of Bulgaria and Romania. Note: Nationals not referred to in the chart above are advised to contact the embassy/high commission to check visa requirements (see Contact Addresses). Single-entry: £60; Multiple-entry: £110. Handling fee of £5 for all applications. Most visas are issued the next working day. Some applications may require authorisation from the Director of Immigration and the Nationality Service in Belize; this will take up to four weeks.